The udder is an amazing structure. 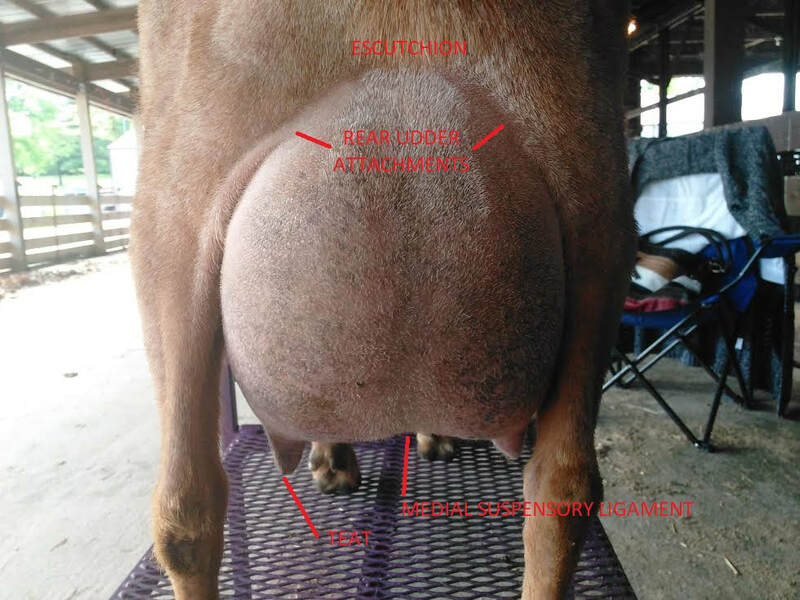 If you are at all interested in milking your goats, you should first understand some basic anatomical terms concerning the udder of the milking goat. There are many attachments which hold the udder to the body of the goat and provide structure to the udder. 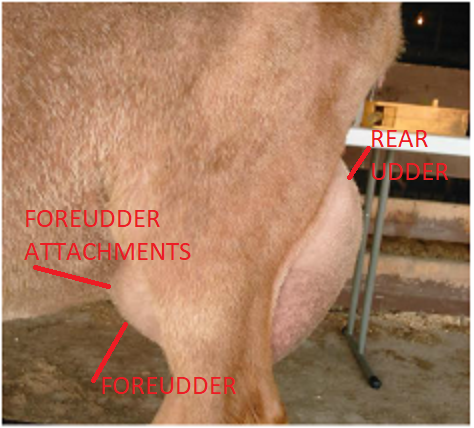 The main areas of attachments are the rear udder attachments, the foreudder attachments, lateral attachments (attachments which hold the udder to the inside of the thighs), and the medial suspensory ligament (MSL) which divides the udder halves and holds the udder floor up. The udder halves are not connected and act independently of each other. The alveoli, which are sack-like microstructures, is the place where milk is produced. Hundreds of alveoli are clustered together to form a lobule. Many lobules make up a lobe. Each lobe, structured like a small cluster of grapes, have a complex duct system that moves the milk from the lobes down to the gland cistern where the bulk of the milk is stored. If the gland cistern is full, there are also minor cisterns near major lobes, where the milk is stored intermediately as it moves toward the gland cistern. Milk is also stored in the duct systems of the udder. The gland cistern is the last stop for the milk, right before it is expressed from the orifice of a teat. Some additional thoughts: Udders fill from the bottom up, first the gland cistern is filled, and then minor cisterns situated close to lobes will fill. Milk is produced on a supply/demand system. If you want more milk then milk more often. If you want less milk, then milk less often. The goat, if she is being properly fed, will adjust. So you might be asking yourself...why does it even matter if I know how an udder works? Let's learn about milking, and I think you will understand. For this section, I am using much of my original 01/06/2013 blog post from my farm page. Cleanliness before, during, and after milking is paramount, especially if you intend to consume the milk, which we do. Clean the teats and udder with baby wipes, or bleach solution and paper towels. Milk is let down when oxytocin is produced. Bump and massage the udder a couple of times to get the oxytocin flowing to trigger the let down of milk. The trick to milking is to trap the milk at the base of the teat with your fingers and roll it out of the teat with your other fingers. I like to use my thumb and index finger in a circle to trap the milk, and then gently close each of my other fingers in turn to gently extract the milk out of the orifice. 3. Close Ring Finger to Finish. Repeat. When you think the doe is near empty, massage the upper part of the udder to trigger those higher lobes and cisterns to let more milk down into the gland cistern. This is called the "hind milk" and many inexperienced breeders miss it. Remember, that milk is supplied according to demand, so if you miss this hind milk, it might not be there tomorrow. To finish milking, remove the bucket from the stand. Spray each teat with FightBac teat spray or a similar teat dip to seal out bacteria that would enter the teat. Release your doe from the stanchion. Milk should be filtered before you store it, as in...as quickly as possible. Even if you can't see it, there are bound to be little hairs and specks of dust that settled in the milk while you were milking. We use a small piece of butter muslin (fine cheesecloth) and pour the collected milk directly into a Ball jar or milk jug. You can also buy milk filters and milk screens that go over the top of your bucket to filter out impurities as you milk. Milk should be cooled as rapidly as possible to preserve flavor and freshness. To cool it quickly, put your bucket into an ice bath and get it down <40° F rapidly. Glass jars are best for storing milk. The glass will keep the milk fresher longer. Plastic milk jugs work too, as long as they are cleaned and sterilized before using them. Plastic is porous and therefore can release unwanted flavors into your delicious milk. If you choose to pasteurize your milk before using it, you can use an automatic pasteurizer or you can heat your milk in a pot to 161°F for 15 seconds, and then cool it in an ice bath. Raw goats milk doesn't really "spoil" it just turns into something else. If you leave your milk in the refrigerator too long, it will likely turn into a sour cream like concoction called clabber, which you can actually use for a ton of things. Pasteurized milk WILL SPOIL. Cream does not readily rise to the top of goat's milk, as it is naturally homogenized. If you leave a jar of goat's milk undisturbed for 3-5 days you'll be able to collect a bit of heavy cream off the top. Raw goats milk will stay fresh for 10-14 days or longer, depending on how it was handled from the beginning. There are dozens of electric and hand actuated milking machines on the market. Most are expensive, require regular maintenance, and require daily cleaning and sanitizing. I cannot recommend any current models, but there are many message boards and groups that you can join to get opinions on all of the options. Even when I am milking 10+ does, I find milking machines to be cumbersome, so I no longer personally use them, although I totally understand why many people do. What Can I Do With All This Extra Milk? I recommend the New England Cheesemaking Company for cheese, yogurt and kefir recipes and supplies, and The Soap Queen for lotions and soap recipes. You can find cosmetic ingredients and packaging at Brambleberry and Bulk Apothecary. Have fun! Now let's venture into the topic of Performance Programs for dairy goats.